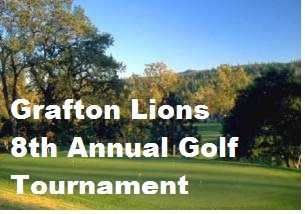 The Grafton Lions Club would like to thank all of our hard working Lions members, the golfers, guests, and sponsors who made our 8th Annual Charity Golf Tournament a tremendous success. The Golf Tournament continues to be our largest fundraiser each year. Proceeds will allow us to continue to with the many local projects and charities that are normally supported by the Grafton Lions Charities, Inc. The tournament was held for the first time at Highfields Golf & Country Club in Grafton on Tuesday, August 18th. The course was in excellent shape thanks to staff of Highfields. The tournament was won by the team of Paul Aasrud, Rob Hammer, Eric Lazzar and Guy Larose with a score of 18 under. The team of Paul Boehnke, John Bauer, Phil Prout and Robert Curtis finished three shots back at 15 under to take 2nd place. Maureen Wojnar won the women’s long drive contest while Jon Orkiseski took the men’s title and Fred Orkiseski won the closest to the pin contest. We would like to thank Homefield Credit Union for being the lead tournament sponsor. We would also like to thank The Salmon Adult Health-Beaumont Nursing Home for sponsoring diner and CSR Financial LLP for sponsoring lunch as well as the following corporate sponsors for their generosity: All-Phase Glass, Avidia Bank, Beaumont Nursing Home, Citizens Bank, Cumski & Levin LLP, Eastern Bank, Fidelity Bank, Grafton Soccer Club, Mikes Car Care, Riemer Associates, and Santander Bank. Thank you to our hole sponsors: Best Auto Body, Bushel N’ Peck, Lions Cindy & Ned Vegnone, Lions Marine & Phil Johanson, Dr. Charles Gagne DDS, Fabrizio/Fortuna, Inc., Goretti’s Supermarket, Grafton Historical Society, Koopman Lumber & Hardware, Kelleher & Sadowski Associates, Mr. & Mrs. Tim Murphy, Pepperoni Express, Peak Financial, Representative David Muradian Jr., Saint Philip Church, Saint Mary’s Church, Senator Michael O Moore, Sunshine Sign, Republic Plumbing, Uxbridge Lions Club and Wojnar Realty LLC.